Riddled with holes, plant leaves are either half-eaten or completely decimated, and seedlings are missing. Whatever showy foliage stood in splendor the night before, now appears unsightly in the early light of day. Telltale trails of the culprits shimmer in the early morning light, leading to dark, damp places. No one dares follow with bare hands. It's slug and snail season in the Pacific Northwest. Slugs and snails would be a mere curiosity if it weren't for their destructive habits throughout our northwest region. I'm sure you could count off a dozen or more plants you would grow, if only there weren't so many slime makers dining on your precious green ones. 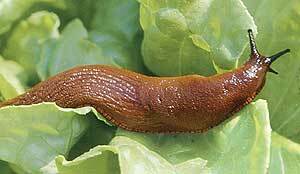 No matter what you do to control them, you will never totally rid your garden of slugs. The only recourse to control them is to keep their numbers down using beer traps, poisons or hand picking. The beer trap method usually means spending your beer budget to feed the slugs, along with keeping a six-pack of suds hidden from the husband so you won't have to wrestle it from him. "No slug is going to drink my beer!" he bellows after you, as you run out the door like a thief, a can of his precious drink tucked under your arm. In addition, the beer trap method means the unpleasant chore of cleaning up a mess of drowned mucous, the result of slugs binge drinking the night before. Sounds like a few of our local college frat parties. Salting slugs should only be the pastime of individuals who take pleasure in torturing small animals and other creatures. Watching slugs writhe in agony as the salt makes them turn their insides out is a scene only fit for B horror movies. Not only that, spraying ammonia and salting slugs may cause harm to the plants you're trying to protect. Fortunately, there are other alternatives. Hand picking slugs off your plants is not a job for the squeamish. I became handy at it, even an expert, by picking up slugs from their sides; thus I avoided the dreaded slime covering my hands. This method of control means going out every evening or early morning on search and destroy missions. It's time consuming, until the numbers decrease. Dropping them in a bucket of soapy water kills them, but then you have a bucket of corpses to deal with; furthermore forgetting to empty the bucket after a few days, is a gross assault on the olfactory senses. Copper barriers work well; however, they are not always practical. When slugs or snails touch the copper they get the equivalent of an electric shock. I like to wrap the copper tape around the base of containers and around the perimeter of raised vegetable beds framed by cedar. If you have trouble with snails and slugs going up into trees, you can brush trunks with a Bordeaux mixture of a copper sulfate and hydrated lime. This will repel the mollusks, keeping them out of your trees. It is reported that a treatment will last approximately one year; however, here in the Pacific Northwest the results may vary. Ducks and geese make good slug predators but can be a problem in the garden by eating your seedlings. Garter snakes also eat slugs. I watched in amazement one day as a small snake consumed a large slug, the process making him immobile and vulnerable to other predators. I stood guard over him until he was able to slither away and hide. Another predator is the large, black ground beetle (Scaphinotus angusticollis). You've most likely encountered the flightless insects scampering away when cleaning up leaf litter. These nocturnal beetles nibble on slugs and snails in the darkness of night. Their larvae have voracious appetites too, so encouraging them to stick around will help you keep other insects in check. Laying down metaldehyde poisonous baits is a hazardous method of controlling the slimy mollusks. Most at risk for being poisoned are children, pets and wildlife, unknowingly eating a poisonous substance. Some people put the bait in containers where the slugs climb in, dine on the poison and die. However, emptying a jar of desiccated corpses is not a pleasant experience. The best thing is to use less toxic methods and take any leftover toxic bait to the nearest hazardous waste disposal site. Face it, dealing with slugs and snails is a messy business, sometimes a toxic business. However, now there's a product that is not only easy to use, it works well for the organic gardener. 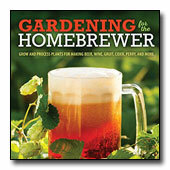 At last there's a safe product I can use in my organic garden and will save me time. No longer do I have to hand pick slugs from my plants, or steal my husband's beer; I have another method available, using organic certified, iron phosphate based baits like Sluggo or Escar-go, to name a few. Ferramol TM is the original formula developed by a German company, W. Neudorff GmbH KG, which has an environmentally friendly philosophy. At Cornell University, a study comparing metaldehyde-based baits, iron phosphate-based bait, and control plots where nothing was used, found the iron phosphate based bait to be the most effective. When slugs and snails eat the bait, they stop eating plants immediately. The upside to this product is, if pets or wildlife eat the bait, it does them no harm. It is safe to sprinkle this bait around food crops; whatever is not eaten goes into the soil as iron and phosphate, both nutrients the plants can use. Although we will never totally rid our gardens of slugs, we can make environmentally friendly choices, choosing non-toxic methods to keep the mollusks at less destructive numbers, protecting prize plants from their enormous appetites. Photo courtesy of Neudorff USA.